What would it be like to live life so in tune with inspiration that you truly believe anything is possible? How would you live your life if you knew you could not fail? Well my friend Becky Rogers, lives life in this manner. Not only does she have 10 incredible children and a thriving business, but she moved her family to Ghana last year to immerse herself in service and humanitarian work. Many of you (including me) may be asking- how could she be that brave? Listen today how she taps into her intuition and her inspiration. How she finds strength and courage to do things that she would not do on her own. Then use this knowledge to create positive change in your own life. This episode is very dear to my heart because it my daughter's story. In my book and on stage I talk briefly about my daughter getting pregnant with a special needs baby and that she ultimately makes the courageous choice to place her for adoption. I have been asked many times to tell the "whole story". Well folks here is your chance to hear it. In every aspect of this story is love. Love instead of fear for the unknown, love for the unborn child, love and strength from the Lord as she is led to her baby's forever family. It is a story of miracles, nights of tears, and moments of unbelievable joy. Learn how a family got bigger not smaller, how a courageous decision made a ripple effect of positive impacts that will most likely span generations. And in true Kelsey style- what does she want to do next? She wants to continue paying it forward and blessing the lives of other birth mothers, adoptees, and adoptive families. Listen in as Kelsey tells her story. How do you balance your businesses, your family, and just life in general? Well, in an attempt to answer this question for this week's show- I have brought in the beautiful Jeanette Bennett, who is an incredibly busy mother of 5 who is the owner and publisher of several magazines including Utah Valley Magazine. If anyone can help us navigate this topic- it is certainly this exceptional lady. Relationships......yes they are the source of our greatest joy, and sometimes the source of our heaviest worries and pain. We definitely value them higher than any other aspect of life. Most of us would gladly sacrifice anything to protect a child or spouse. So how can we bring more connection, peace, and love into our relationships? How can we get over resentment, pain, and frustration? Life tends to throw curve balls at us from time to time doesn't it? Just when you start to comfortable-BAM! Life happens once again to teach and guide us. This week, Shantel McBride shares her own pivotal moment and the curveballs that were thrown at her. At one point in her life- she lost nine people in her life. She was never able to grieve her losses as another one would pass away before processing the grief from the first-all leaving her within a 3 month period of time. Wouldn't it be amazing if we could rewire our brain so that we had less overwhelm, less procrastination, less anxiety, and replace it with more joy, peace, and fulfillment? Well- what if you could?? Angela Bell is a Neuro Life coach. She is going to talk about the three basics in life which is worth and power which equals safety. These principles will change everything in your life-relationships, financial abundance, and self acceptance. How often do we create our own life of misery, pain, and hopelessness? How often do we place a limit on what we can accomplish and place a glass ceiling on what we "believe" we are worthy of? How do you get out of your own way, and allow yourself to flourish in relationships, self-worth, and financial abundance? It's hard to believe that a woman like Tauni West could ever have been anything but a trailblazer. She is one of those women that seems to have it all- physical beauty, a thriving career, a well-balanced home life with five kids and a great husband that supports and cheers her on. However Tauni describes herself as a shy and awkward young girl who had little self-confidence and felt simply "quirky". If you are like most women, you either deal with anxiety and depression personally- or have someone in their family or circle of friends that have this in their lives. Tiffany shares her own personal story on learning life lessons that now enable her to work with people on their own mental health journey. Today's episode is all about how life can throw you curveballs at you unexpectantly. It is what you do with these moments that truly define a person. Becky Mackintosh is one of those individuals that chose to love deeper, give more, and understand others through these challenges and has learned to embrace and love her journey. I believe that this episode will impact so many listeners. My friend Sabrina was a survivor of sexual abuse and victimization from an early age. The reality is that 1 in every 3 females has been through this horrific experience. As she started to heal- she was impacted by another traumatic event that caused her to question her actual existence. Sabrina takes us on her journey on all of her cycles through hurt, anger, retaliation and finally to a place of forgiveness and true healing. Seven years ago the unthinkable happened to Amanda's family- her two-year-old boy never woke up from his sleep. This tragedy led her to go on a journey of grief, deep reflection, and understanding the mental health issues that accompanied it. Do you ever feel like life just tugs and pulls at you constantly? Women and mothers wear so many hats, it is not uncommon to feel overwhelmed, discouraged, and running in circles. Listen to this incredible episode where Connie Sokol explains how to get more balance, more joy, and clarity in our lives. Do you feel like you are your own worst enemy and can't seem to get those negative voices out of your head? Learn the secrets for going from self-critical to self-confident. 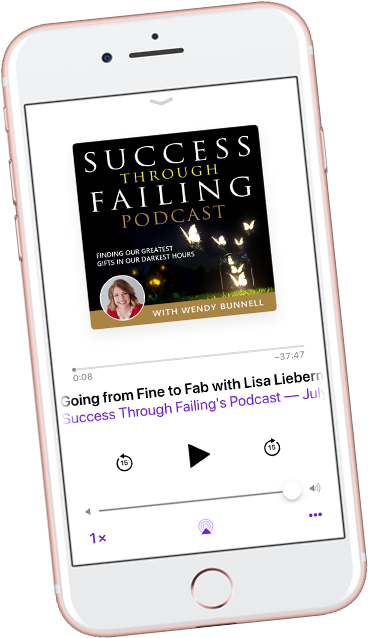 This episode is a little different as the host- Wendy Bunnell shares her own story of how she went from a place of complete defeat to a place where she understands her purpose and value.